Crusaders in Tripoli. Bohemond VII, AD 1275-1287. Silver half Gros. Denomination : Silver half gros. Mint : Tripoli. Date : AD 1275 to 1287. Reference : Coinage in the Crusader States -Tripoli #27. Size : 18.7 x 19.5 mm. Weight : 2.12 grams. Grade : VF with some weak areas. 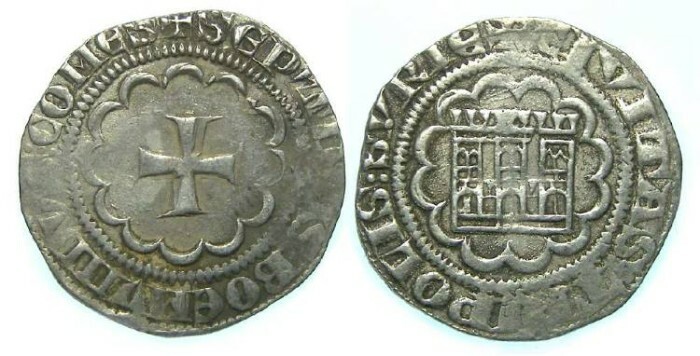 Obverse : Cross in a circle of twelve arches, with SEPTIMVS BOEMVNDVS COMES around. Reverse : Triple towered two story gateway, in a circle of twelve arches, with CIVITAS TRIPOLIS SVRIE around.